We fear that the following list of bills would hurt Oregon’s minority and immigrant communities. 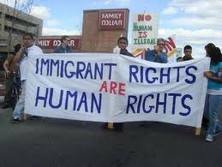 We are particularly concerned about proposed legislation that mirrors the extreme policies of Arizona’s SB1070. HB 2802 Prohibits restrictions on public body’s ability to enforce immigration law to extent permitted by federal law. Authorizes legal resident to bring civil action against public body that violates prohibition. HB 2803 Requires county to verify immigration status of person incarcerated in county correctional facility. HB 2804 Requires evidence of citizenship for persons registering to vote for first time in this state. HB 2805 Prohibits state agencies from providing employment, products, services or licenses to persons who are not lawfully present in United States. HB 2806 Limits deductibility of expenses related to employment of workers hired on or after January 1, 2012 to workers whose eligibility for employment in United States has been verified through federal E-Verify employment verification system. We must take immediate action to ensure that none of these extreme bills have a chance of becoming law. In addition to creating a divisive climate, they also represent an economic burden for our state and local governments, businesses, and local law enforcement agencies—something our state can’t afford. Please call our newly inaugurated Co-Speakers of the House, Senate President, and Governor at the phone numbers below. Tell them that Oregon is not Arizona. Let them know that we don’t want Representative Kim Thatcher or others to create a divisive political climate in Oregon. Explain that we do not want our state officials to take the role of federal agents. We want common-sense solutions to our economic problems and not extremist legislation.